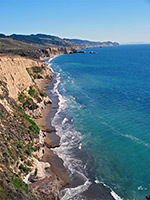 Thirty miles north of San Francisco, the Pacific coast arches outwards forming a triangular peninsula, bordered on the ocean side by long, wind-swept beaches beneath high cliffs or extensive sand dunes, and inland by a straight valley, the top half of which (Tomales Bay) is beneath the sea. This stretch of isolated land, all protected as Point Reyes National Seashore, is separated from the rest of California by the San Andreas Fault between the Pacific and North American tectonic plates, causing it to shift gradually northwards at a rate of 3 cm per year. The extent of this movement is evident from the matching geology of the range of hills in the center of the peninsula (Inverness Ridge) with that of the Tehachapi Mountains near Los Angeles, 300 miles southeast. 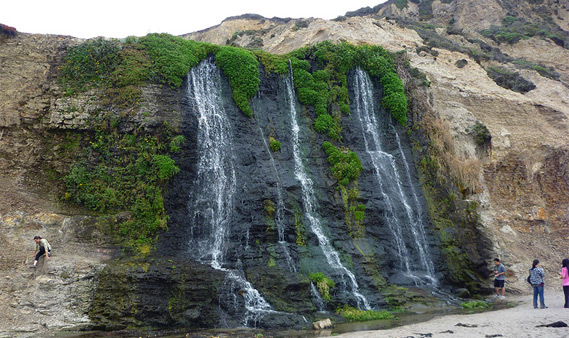 Around 150 miles of trails cross-cross the rolling hills and meadows of Point Reyes though the main attraction is the 60 mile shoreline, which is easily accessible by car in several places and all is explorable on foot. There are three distinct parts of the coast: the section alongside the calm waters of Tomales Bay has a few small beaches though the majority of the land is quite densely wooded, the trees extending right to the edge of the sea. The long, straight, northwest-facing shore (Point Reyes Beach) has the most sand and the highest surf, though also suffers from the worst weather, with strong winds, cool temperatures and thick fog often present. More interesting is the south and southwest-facing coast, as here the land is a little less wind-swept and the shoreline varies between sandy beaches, rocky terraces, promontories, cliffs, lagoons and dunes. The approach to Point Reyes National Seashore is along narrow, winding roads through the coastal hills - either the main Pacific highway California Route 1, which despite its fame is also thin and bendy in many places - or along the country roads from San Rafael, Novato and Petaluma. The land hereabouts is gently undulating, covered by a mixture of grassy fields and small woods, mostly undeveloped apart from scattered farms and houses. The only town of note near the ocean is Point Reyes Station, a small settlement 2 miles from the south end of Tomales Bay and right in the middle of the San Andreas Fault Zone. The town has a few shops, restaurants and a gas station. Some of the land to the south, adjoining the national seashore, is part of Golden Gate NRA, and is also crossed by a few paths. The visitor center for the national seashore is located a little way further south in Bear Valley, near the village of Olema, in a field at the edge of the wooded hills that characterize the east side of the Point Reyes peninsula. It is quite a large building, often with several hundred people in attendance on busy summer days, reflecting the general popularity of the park, as despite the relatively difficult access, the proximity to San Francisco ensures many visitors. Unlike most NPS units there is no drive-in campground, only four campsites accessible to hikers - two on the coast and two in the hills, and as the majority of the land away from the park is privately owned, free camping is not generally possible either. The best nearby commercial site is at Dillon Beach, 25 miles north of Bear Valley along Route 1, where dispersed camping is provided on a large area of sand dunes and grassy fields. Four main roads (Sir Francis Drake Blvd, Pierce Point Road, Mesa Road and Limantour Road) allow vehicular access to some parts of the Point Reyes peninsula, and the latter ends right beside the coast, at Limantour Beach. Several spur roads also lead to beaches, while many more sections of the coastline, the northern grasslands and estuaries, and the wooded interior, may be seen by hiking - single trails range from less than half a mile to over 15 miles in length, and many loop hikes are possible. Some routes are also open to cyclists and horse riders. 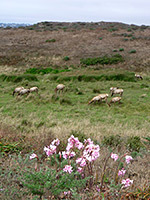 Besides the varied scenery, attractions include birds, other wildlife (the largest creatures are elk, whales and sharks), wildflowers, and historic structures, such as the lifeboat station and lighthouse on the tip of Point Reyes, and around 20 working cattle ranches, established in the 19th century. The closest towns with hotels near Point Reyes are (with distances from the Bear Valley Visitor Center): Petaluma (20 miles), Novato (20 miles), Larkspur (21 miles), Corte Madera (22 miles), Mill Valley (24 miles) and San Francisco (35 miles).